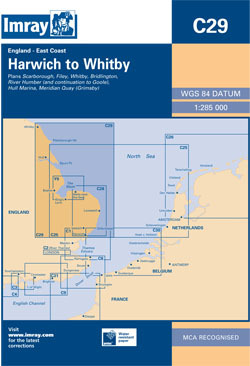 Passage chart of the east coast of England fromm Harwicxh to Whitby. Scale: 1 : 284,544. Five-minute gridlines. Larger scale plans of Whitby, Scarborough, Filey, Bridlington and the River Humber. Tidal stream diagrams. For this 2016 edition the chart has been fully updated throughout. Depths from the latest known surveys have been used, particularly in the River Humber and estuary, and the waters around Great Yarmouth and Lowestoft. The chart shows the latest wind farm updates, plus harbour developments at Grimsby.